ISLAMABAD, Aug 3 (APP): Prime Minister Muhammad Nawaz Sharif on Wednesday highlighting the importance of sustainable peace and development in the region, said the resolution of issues with other countries through peaceful means was need of the hour. “We cannot afford clash [with other countries], lest our ongoing economic and social progress will come to a halt,” the Prime Minister said in his address to the country’s ambassadors here at the three-day Envoys Conference. He, however, said the country’s efforts for maintaining peace on the basis of mutual respect and balance should not be considered as its weakness. “We believe in respect for each other’s solidarity, independence and non-interference,” he said, adding that Pakistan was in favour of global peace. The Prime Minister, who presided over the concluding session of the conference, said today’s Pakistan was far more peaceful, prosperous and stable as compared to that in 2013. He said with much satisfaction, the case of Pakistan could be presented before the world as a country with strong economic prospects and safe investment-friendly environment. He said a nation could get isolated at international level if devoid of coherence with regional and international character. “Besides safeguarding our values, we also have to keep in view of benefitting from international trends,” he said. 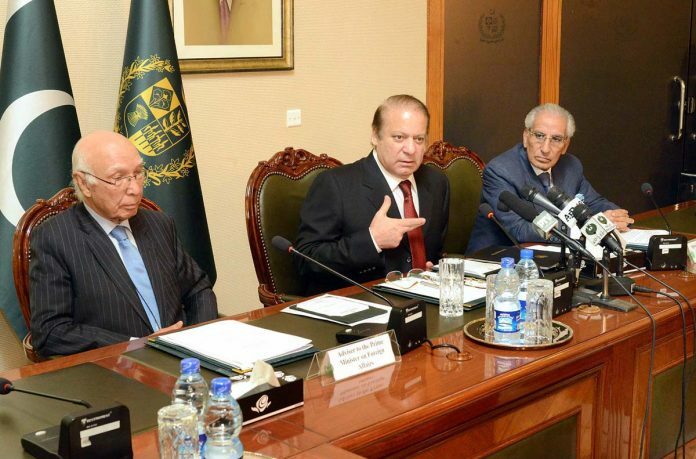 Nawaz Sharif said today Pakistan was confronting challenges at several fronts, particularly terrorism and extremism. He mentioned that National Action Plan and Operation Zarb-e-Azb were contributing to maintaining law and order in the country and lauded the sacrifices of army, police, Rangers and law enforcement agencies. “Terrorism has almost been eliminated from the country’s soil while a comprehensive policy is being devised to end extremism,” he added. The Prime Minister termed support to the Kashmiris’ demand to self-determination in accordance with the resolutions of United Nations Security Council the “cornerstone” of Pakistan’s foreign policy. He said the indigenous movement of Kashmiris for their freedom was rejuvenated with the sacrifices rendered by the young generation. “You have to convince the world that Kashmir is not the internal affair of India. The UN has regarded it as a disputed matter between Pakistan and India,” he told the ambassadors. He urged the envoys to highlight the human rights violations in Indian-held Kashmir. The Prime Minister said relations with China had gained more importance with the launch of China-Pakistan Economic Corridor (CPEC), which was an economic game-changer for the region. The CPEC would also benefit Iran, Afghanistan and Central Asia, and would result in regional prosperity, he added. He said Pakistan would continue to make efforts for Afghanistan’s stability and peace. “The world must know that Pakistan will never allow its soil to be used by terrorists against any other country,” he said. The Prime Minister asked the ambassadors to use their offices in promoting Pakistan’s positive image abroad. “Introducing the green passport as a symbol of respect and honour will be your real success,” he said and expressed the confidence that they would consider their responsibilities as a sacred mission. The envoys, who attended the conference, included Jalil Abbas Jilani (Washington), Masood Khalid (Beijing), Abdul Basit (New Delhi), Dr Maleeha Lodhi (United Nations, New York), Ayesha Riyaz (Vienna), Naghmana Hashmi (Brussels/European Union), Abrar Hussain (Afghanistan), Tehmina Janjua (UN/Geneva) and Qazi Khalilullah (Moscow). Defence Minister Khwaja Asif, Prime Minister’s Advisor’s on Foreign Affairs Sartaj Aziz, Special Assistant Tariq Fatemi senior officials of the Foreign Ministry also attended the moot.